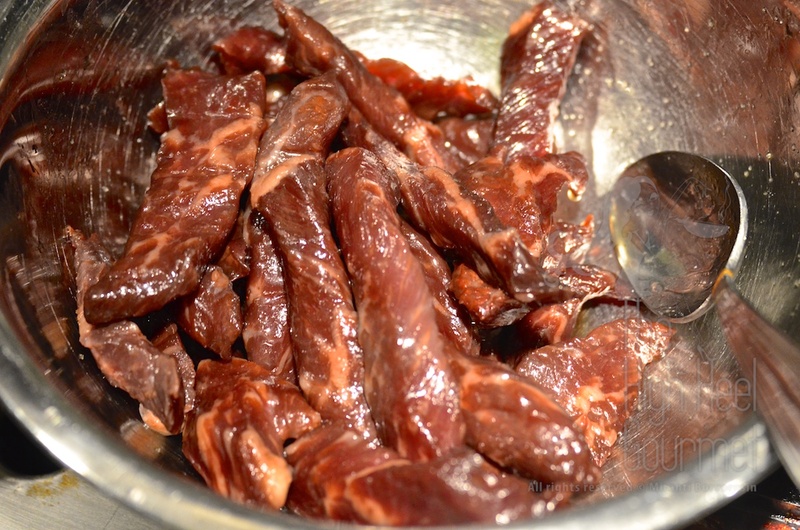 I shouldn’t have posted the Kaeng Pa, or Jungle Curry, recipe without this beef jerky to accompany it with. They go great together. In fact, they not only go good together as two different dishes, but also, Neau Dad Deaw or Neau Khem can be added into Kaeng Pa as a source of protein, too. 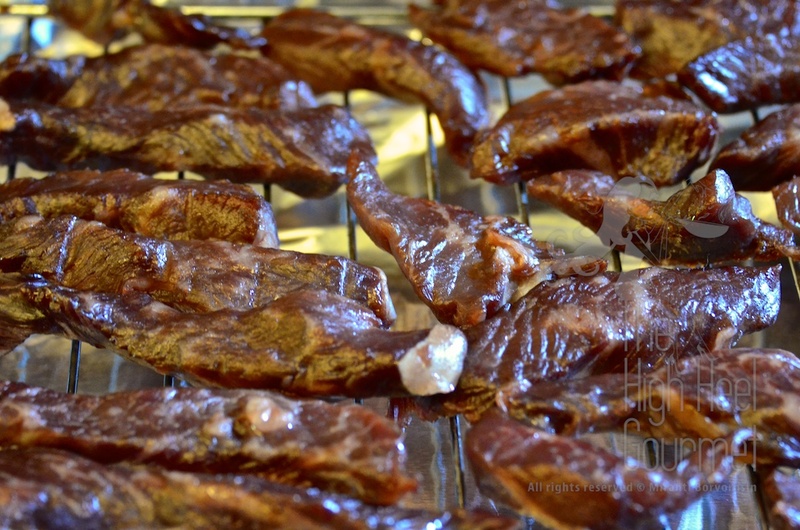 What’s this sundried beef jerky, actually? 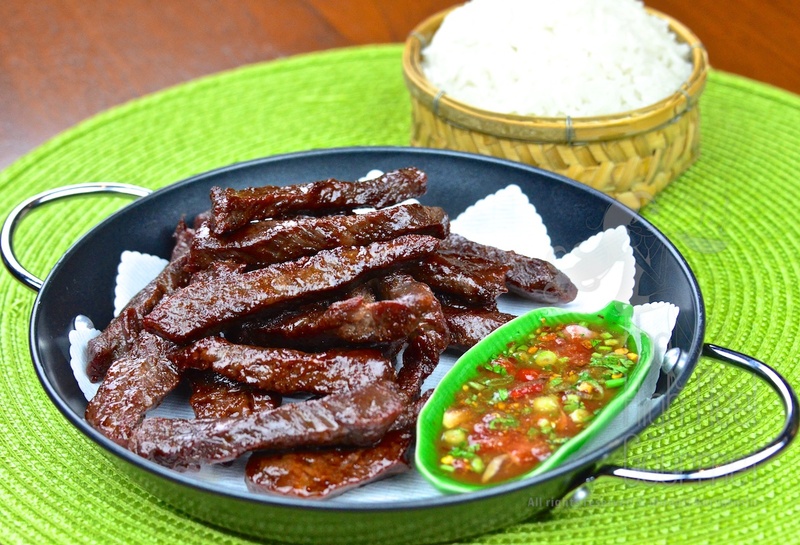 It’s beef that is cut in thick strips, marinated in sauce and dried in the strong Southeast Asian sun in the midday for a couple hours. That’s why they call it Dad Deaw, which means single sun, or one-time sun. The beef will feel dry to the touch on the outside but soft and tender on the inside. 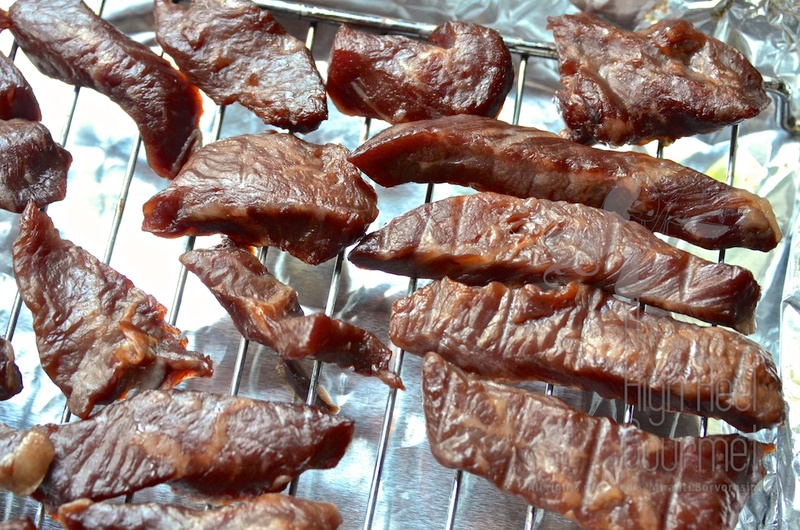 It’s partially dehydrated marinated beef strips. 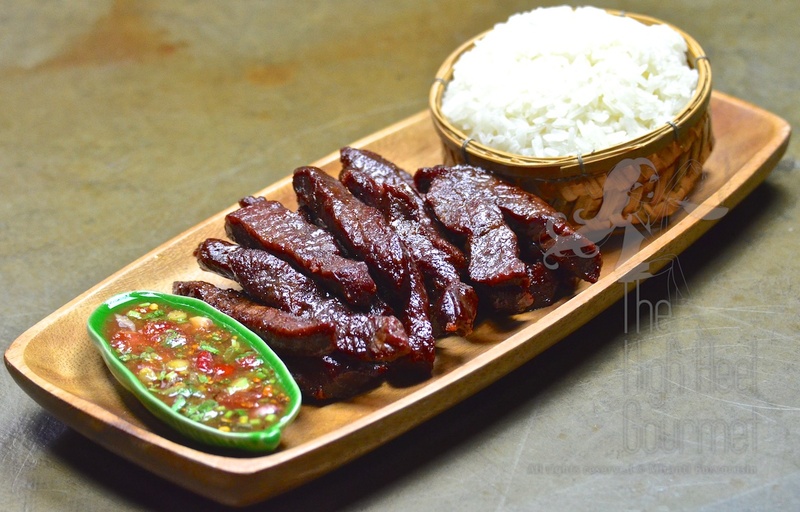 If you’ve ever been at a Thai restaurant that serves this dish, which most do, it might be listed as Neua Dad Deo, Neur Tod, Neu Khem Todd, Thai Fried Beef Jerky, Sun-dried Jerky, Jerky Beef Dried in Single Sun (this is funny to me…makes me wonder which dating site Mr. Sun should be using). Also they have a pork version with the name that replaces Neau with Moo. Do you wonder about the status of the beef if it was dried in double-sun, triple-sun or quadruple-sun? If you did, congratulations, you’re starting to think like me. (Not sure if I should congratulate you or feel sorry for you though, frankly.) Yes, the Thai have their own version of beef jerky. The difference from the Western style is this: the Thai never eat them uncooked. The sun-dried beef jerky that is dried until the beef gets completely dried all the way inside is called Neau Khem, Neu Kem, or salted beef. But when they said Neau Dad Deaw, you can expect the beef to be more tender on the inside. 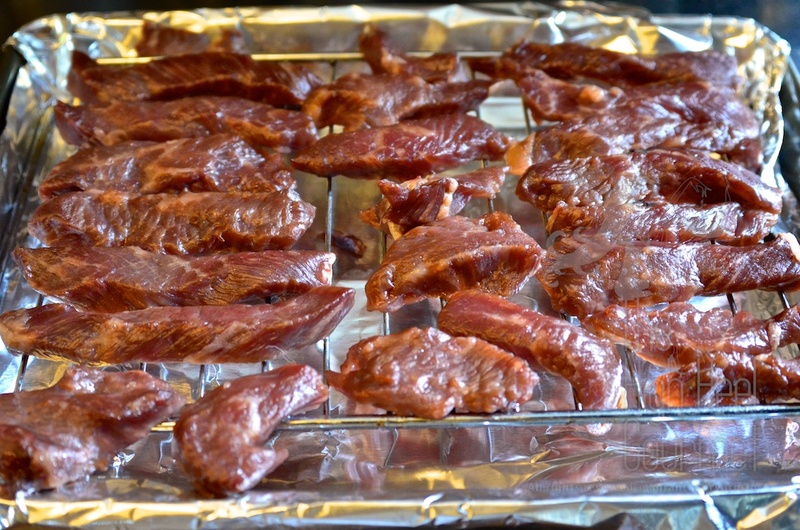 My method to make sun-dried beef jerky is not the traditional way. I can’t just dry my beef in the sun here, or my cat or my dog will have eaten them before they’re even dry! I use the oven method, which is much cleaner and faster. To dry beef in the sun, it would take about 2-3 hours, but in the oven it only takes an hour. In this recipe I will season the beef in two steps. The second step is just for extra flavor. You don’t need to do it; it’s optional. If you’ve ever eaten this in a Thai restaurant here, they probably didn’t do the second step either. BUT, if you decide to skip the second step, you might want to add more seasoning to the first step, just to make sure that you get the same taste. The reason I like to separate the seasoning into two parts is just to amplify the Maillard Reaction. To explain this reaction in short, it’s a way of adding color and much more flavor that is derived from the reaction between amino acids and reducing sugars under heat. The Maillard Reaction gives brown colors and desirable flavors to the foods. You will get that reaction from one step seasoning too, but two steps will get more. Oil or lard 1-1/2 cups. 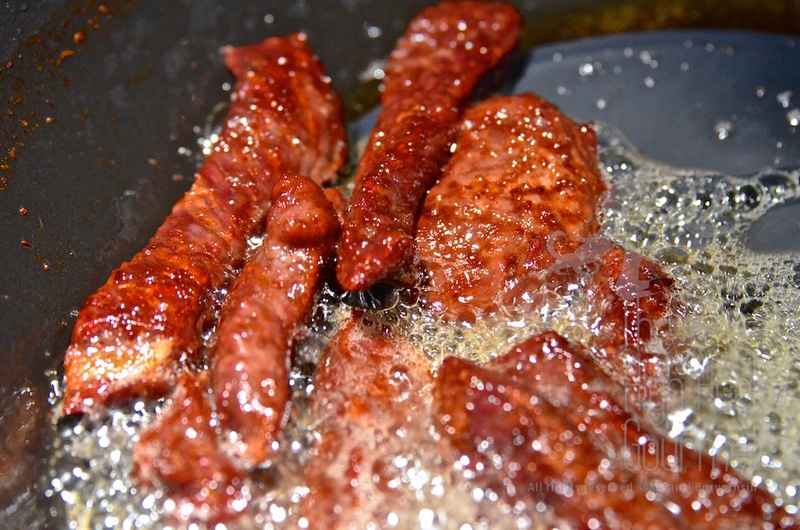 You want the oil to cover about 1-1/2” – 2” from the bottom of the pot or pan you use to fry the beef. 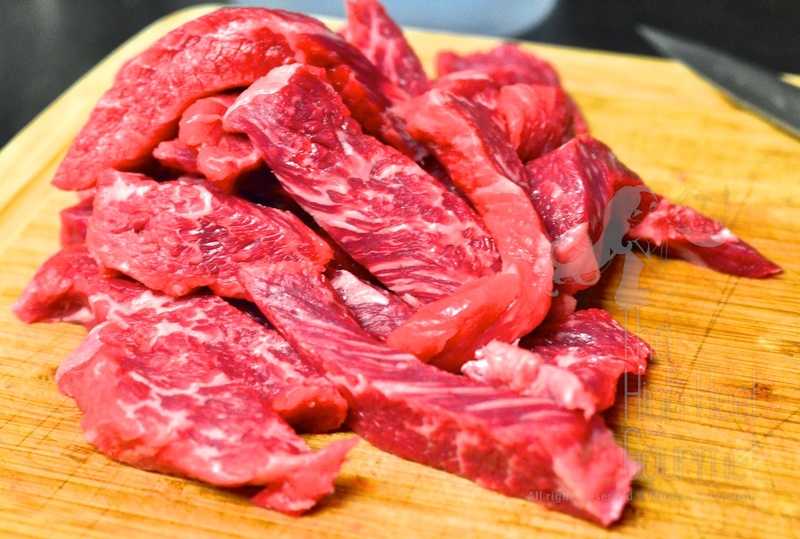 1) Cut the beef into strips. The preferred size is 1/2” x 1/2” and not more than 4” long. This is the most important step: make sure that the grain of the beef is NOT running along the length of the cut. It should run perpendicular to the length. This is to ensure that your beef strips are chewable. 2) Add all the seasoning from part one to the beef. Stir, toss, massage–whatever method you are comfortable with to get the marinade to coat every piece of beef. 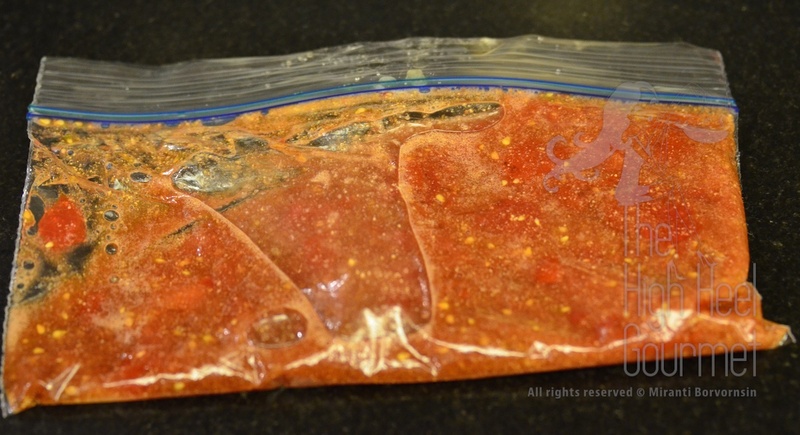 Then refrigerate overnight. 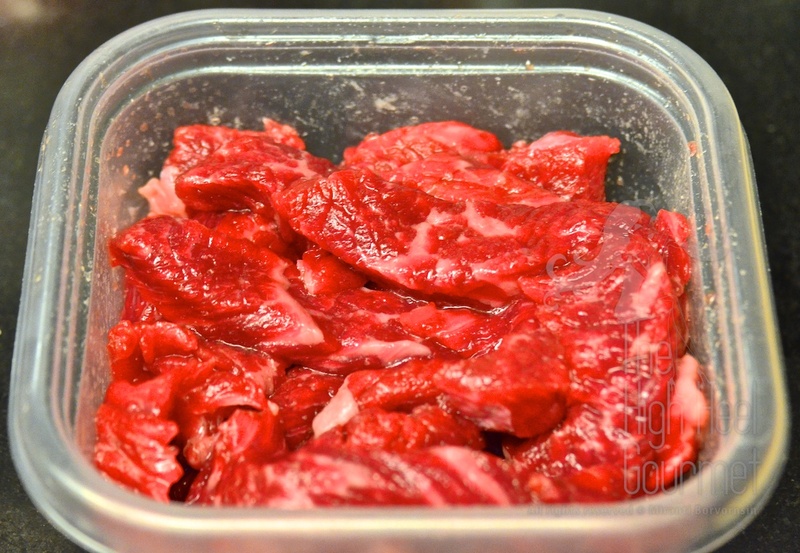 3) The next day, get the beef out, let it warm up to room temperature. In the meantime, warm up the oven to 150ºF, 65ºC, then line up the pieces of beef one by one on the rack, leaving some space between them, and put the tray in the oven. 4) Bake for 20 minutes before you pull the tray out and turn the pieces, not turning from left to right but from top to bottom. You will see that the top part of the beef pieces start to dry to the touch. Once you turn all the pieces, put the tray back in the oven for another 20 minutes. 5) After the 20 minutes pull the tray out and turn the beef pieces again. The beef pieces should be slightly wet on the bottom only. After this last turn put the tray back in the oven again for another 20 minutes. After this last bake, the beef pieces should be dry to the touch all around but the inside should still be soft. You can squeeze them to determine that. 6) Mix the second part of seasoning in a bowl, add the beef pieces to the seasoning and toss them until the seasoning coats every piece. 7) Heat the oil in the pot or pan over medium heat. The test for temperature: if you don’t have a thermometer, the trick is to use a wooden chopstick, dipping it all the way to the bottom of the pot and seeing if there are a lot of bubbles coming out of the tip. If there are, the oil is ready. The temperature is 275º-325ºF. I normally don’t measure things in the usual way, you know. 5) Shake the excess seasoning off the beef strips and add to the pan. Do not put all of the pieces in there at once!…Hello… I fried them in two batches. Stir often. It takes about one to one-and-a-half minutes to cook the meat. 6) Take the strips out of the oil and let them drain on a rack. 7) I eat this with sticky rice and Nam Jim Jaew, but this is a different Nam Jim Jaew. It contains tomatoes. This entry was posted in Accompaniment, All Day, Beef Bison Buffalo, Comfort Food, Deep fried, Dinner, Finger food, Gluten Free, Lunch, Sauce, Small bites, Snack, Sticky Rice, Thai, Thai Dipping Sauce and tagged Asian, Cooking, deep fried, Easy recipes, Food, gluten free, Recipe, Sauce, Thai food. Bookmark the permalink. Do you think this could me made in an air fryer? At which step that you want to use the air fryer? The drying step, lowest temperature until the outside dry. 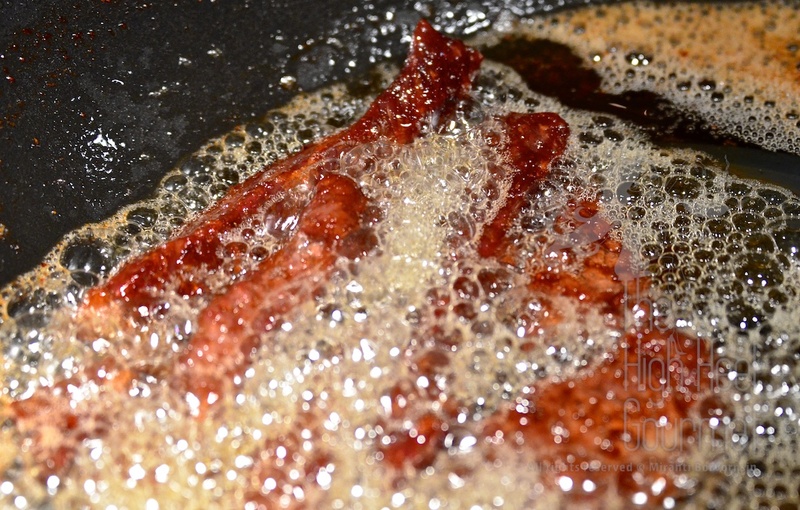 The frying step, add a teaspoon of oil (or more if you are using very lean meat) into the second batch of seasoning that you toss the meat strips in before frying. Medium heat and short time. If you are using pork, make sure that it cook all the way through.